It is a question we get asked by about thirty per-cent of people who come into the shop. It’s certainly a question I thought to ask even though I ended up buying A Chart of Oxford Printing 1468-1900 the first time I came in (it’s a gem). Still, I like the question; it shows a healthy curiosity in beginnings, in origins. The answer, man; stop babbling and answer. It’s a 1505 edition-with-commentary of Seneca's tragedies. 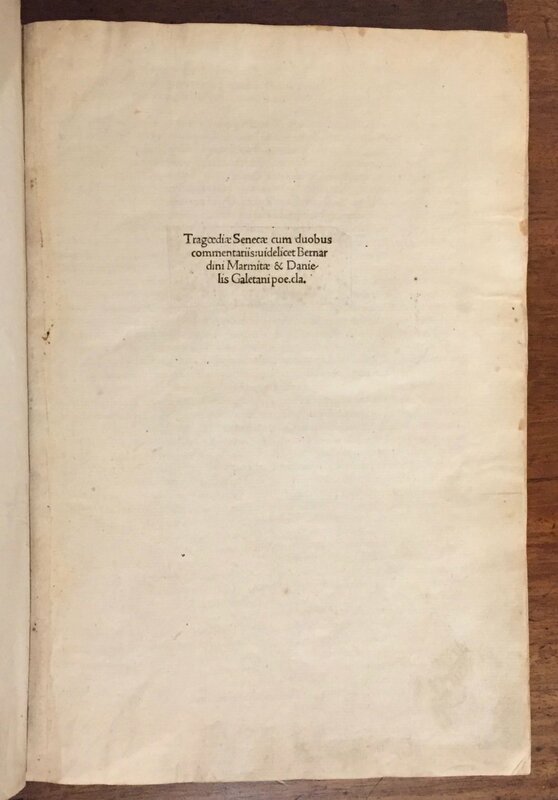 It’s nearly identical to a 1498 edition of the same, so in my book it’s a “quasincunable”, very nearly made in the infancy of printing in Europe. It’s really lovely: bound in vellum with a stab-binding (the thread punched through the spine-edge of the text block top-and-bottom is still visible), hand-written title – everything a Very Old Book should look like, really. The text is presented in the manner of manuscript commentaries: the plays's text is closest to the spine, and the commentaries (there are two) surround the text. The two (Daniele’s and Bernardino’s) were initially brought together in a Venice edition of 1493 (printed by Matteo Capcasa of Parma). The direct antecedent of the current item was a 1498 edition by Giovanni Tacuino (Ioannes Tridinus de Cirreto alias Tacuinus, working in Venice at the same time as Aldus Manutius), and the 1505 edition aims to be identical (the 1498 edition has identical mis-numberings of the leaves [except that leaf CXXXV was in the 1498 edition headed CXXV but has in the 1505 edition been corrected]; the woodcuts are different or missing in the 1505 edition, and some spellings change [e.g., lachrimis becomes lachrymis]). Some fifteen years after Andreas Gallicus’ editio princeps, these twin commentaries were part of a florescence of interest and scholarship on the Stoic, whose plays, despite being exceptionally dense and challenging, were incorporated into curricula across Europe. (Gellio) Bernard(in)o Marmitta (Padua, 1440-1497) was a professor of Humanities, probably in Parma; his commentary was initially published in 1491. Daniele Gaetani (Cremona, 1461-1528) was a professor of literature (in Cremona? ); his commentary was initially published in 1493. Bernardino’s is decidedly the fuller commentary, but Daniele has the better Greek (or at least prints it), and so provides more context of Seneca’s models and antecedents; the two work together very nicely. An early owner of the current item was also a scholar; a great many of his emendations and conjectures (mostly on Hercules Furens, Medea and Agamemnon) are those accepted by modern editors (who have, as the owner or editor did not, the benefit of understanding Senecan scansion). Having spent a little time learning from two very fine Senecan textual critics (Dr. Heyworth and Professor Reinhardt), I have some small appreciation of the challenges of the transmission. This early attempt – more than an attempt; a rich success! – is a delight to hold. Folio in 6s (11 5/8” x 7 7/8”, 299mm x 202mm). Binder’s blank, A4 (±A1) a-z6 &8, binder’s blank [$3; –A1, A3; +&4; A2 signed A ii]; 150 leaves (leaves numbered I-LIIII, LIIII LV, LVII-LXXVIII, LXXVIII LXXIX LXXX LXXXI LXXXII LXXXIII, LXXXV-CXLV, CXVI); pp. , , blank; A1r pasted title (2 3/4” x 1 1/4”; woven paper? ); A1v blank; A2r-v dedication to Leonardo Mocenigo (1445-1534, ambassador and minor humanist; son of Giovanni Mocenigo, Doge 1478-1485); A3r poem in defense of “Polydori Comitis Cabaliati” (i.e., Polidoro Sforza, son of Francesco, Duke of Milan); A3v dedication to Guillaume de Rochefort (Lord Chancellor of France, 1483-1492); A4r-v interpretive analysis of the tragedies of Seneca, addressed to same; a1r -&5v text and commentary; &6r registration; &6v blank. The binding; note the hand-written title and the visible binding thread. An example of the format (i1v). An aside — the title-page would at first glance appear to have been mutilated — a rectangle cut from an original sheet and mounted on a new one. But, in collating our copy with other institutional copies, it now appear that this is in fact how the book was issued by the publisher; anything was possible this early in the history of printing!